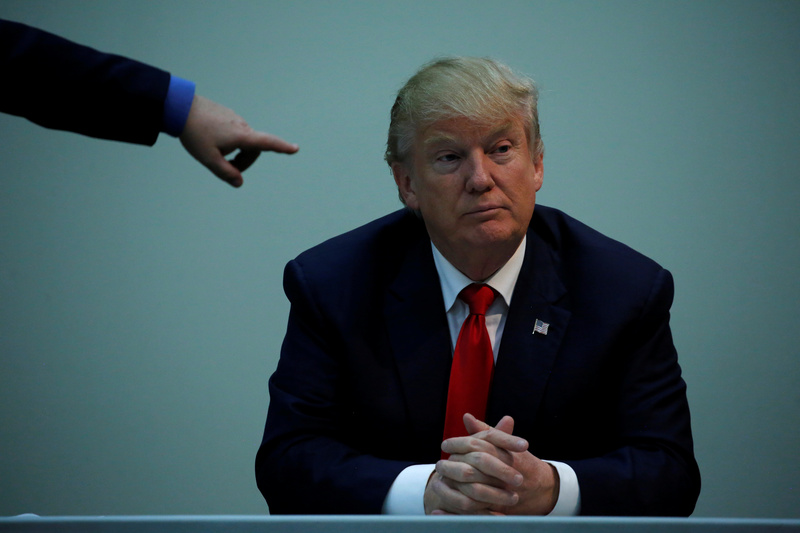 President-elect Donald Trump has been parsimonious with details about his plans. He talked broadly about fixing roads and bridges, enforcing borders and security, chilling out on regulation – and retaliating against those who don’t share his vision. Mr. Market is filling in the blanks. U.S. equities started mostly flat on Wednesday, but specific enterprises were targeted to benefit from the new Republican leader, while perceived losers were punished. 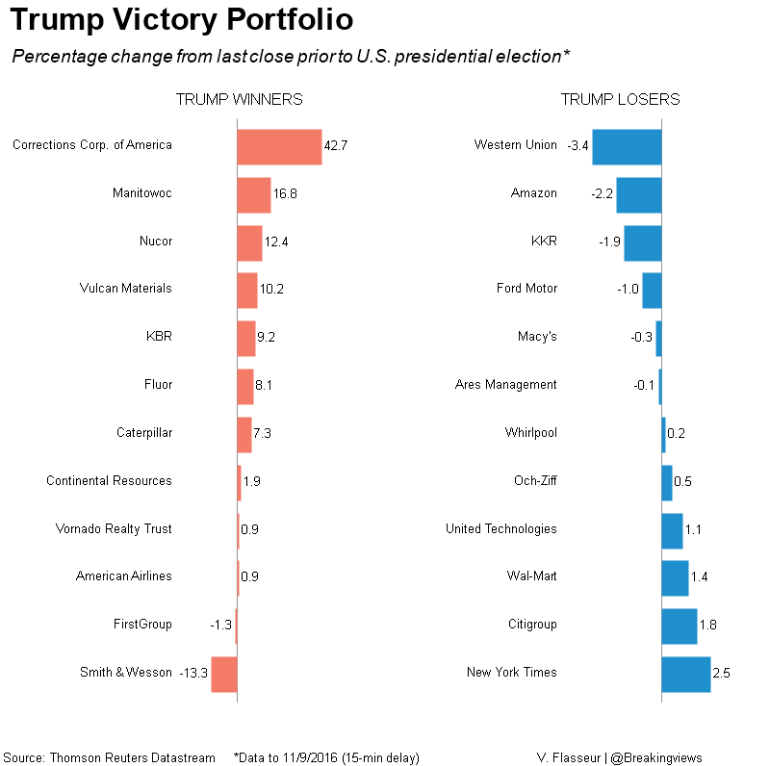 Many of these ideas showed up in the Breakingviews Trump Victory Portfolio in September. The New York real-estate mogul’s pledge to rebuild America added $3 billion of value to Caterpillar, which makes earth-moving equipment. Smaller rival Manitowoc’s shares jumped 15 percent. United Rentals and Britain’s Ashtead, which lease such machinery, also saw their stocks surge, as did providers of other materials and engineering services, such as Vulcan, Martin Marietta and Fluor. Steelmaker Nucor joined in the ebullience, too. Trump’s pledge on law and order, evoking Richard Nixon’s similar proclamation, created other market beneficiaries. Corrections Corp of America stock soared as much as 50 percent as threats to the for-profit incarceration industry receded. Meanwhile, gunsmiths Smith & Wesson and Sturm Ruger were pummeled as fears of new firearms regulation dwindled, and with them the need for consumers to stockpile weapons. For-profit colleges rallied amid optimism that an administration led by one of its own – the founder of Trump University – would breathe life back into an industry that suffered bankruptcies amid new rules issued by President Barack Obama. Shares of DeVry Education and Grand Canyon Education gained. Drugmakers gained as price-cap fears dissipated, while owners of healthcare providers prepared for surgery on Obamacare. Oil and gas explorers got a bump, too, on hopes of less regulation. There were Trump-specific losers, too. Ford Motor, Whirlpool and United Technologies, which took heat from him during the campaign for sending jobs overseas, had a bad morning. Shares of Amazon, whose boss owns the Washington Post – which aggressively covered Trump and endorsed Clinton – dipped. Trump has suggested he would look at Amazon’s antitrust and tax positions. The precise contours of the next president’s proposals to improve the American economy are only starting to take shape. For now, investors seem to have a better read on those policies than even Trump does. With additional reporting by Kate Duguid. Republican U.S. presidential nominee Donald Trump meets with law enforcement and first responders at the St. Johns County Sheriff's Department in St. Augustine, Florida, U.S. October 24, 2016. Republican Donald Trump defeated Democrat Hillary Clinton in Nov. 8's U.S. presidential election.